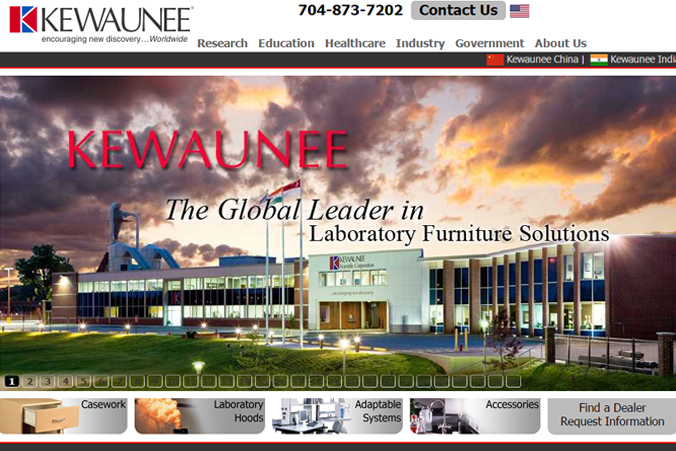 Kewaunee Scientific Corporation, based in Statesville, NC, has been a leader in laboratory furniture solutions for over 100 years. Through both World Wars, the company grew to become the recognized global leader in the design, manufacture, and installation of laboratory, healthcare and technical furniture products. Look in almost any laboratory today – in schools, medical facilities, and research environments – and you’ll find Kewaunee Scientific furnishings. After working with several iterations of its corporate website over the years, Kewaunee determined that the site, developed using Ektron CMS on the ASP .NET platform, was not performing adequately for the company’s needs. The underlying architecture was resulting in very slow load times, and some of the Ektron CMS features such as Taxonomy or Smart Forms were not being leveraged. Kewaunee Research embarked on a search to find the right vendor to re-architect several modules and optimize the site for the platform on which it was built. The company ultimately invited multiple vendors to bid on the project to provide a solution, one of which was Innovare Technologies. Innovare reviewed the Kewaunee corporate web site and architecture of the system, performed an initial architecture and code review, considered the objectives of the project, and submitted a detailed overview of its recommended approach to an efficient solution to solve the problems that had plagued the site for years. After about a month of discussion, reference checks and pre-planning, the Innovare approach was agreed to, the project was launched and Innovare went to work. Although all development work was performed at Innovare’s San Jose, CA location by a team of developers, project communications and management were handled through regular online conference calls, as Kewaunee is headquartered in North Carolina. The new site – which serves Kewaunee’s audiences globally and includes sites for India and China – provides a new standard for the company’s web presence, offering a wealth of information and technical resources for prospects and customers across various industries. Since the original project completion and delivery in 2014, Innovare has continued its relationship with Kewaunee Scientific, providing development support for periodic new features, updates and extensions of the sites functionality to enhance the user experience. Learn more about Kewaunee Scientific.